We need your financial support for the upcoming 8th Annual Teen Pregnancy Prevention Rally that is being held on April 10th at the St. Louis University Chaifetz Arena. The event is the culminating activity of the year-round Teen Pregnancy Prevention Program that Better Family Life administers in 22 local schools for middle and high school students. 2,800 students will attend. Please join us as an Ally and Sponsor. Sponsorship levels are included on the website as well as a brief abstract of the Teen Pregnancy Prevention Program. For additional questions, please call Miranda Jones at 454-0622, Ext. 716. The Youth Rally is an opportunity for students to get educated and energized and to celebrate their success in the Teen Pregnancy Prevention Program. The Youth Rally will be filled with education and entertainment designed to unite, empower and excite youth about abstinence education and healthy relationships. The year-round Teen Pregnancy and Prevention Program is supported by a grant from the U.S. Office of Adolescent Health. 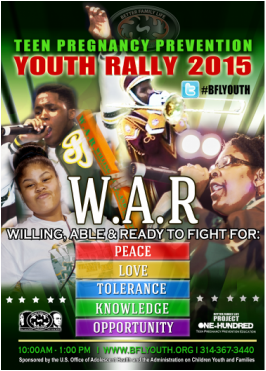 However, funds are needed for the Youth Rally to: 1) provide bus transportation to/from participating schools to the Youth Rally; 2) provide students with lunch; 3) secure a prominent motivational speaker; 4) provide students with a Youth Rally t-shirt; and, 5) provide educational materials that will be distributed to students. In 2009, St. Louis ranked #1 for sexually transmitted diseases of youth between the ages of 12 and 24 and remains among the top in the nation in 2014. As a result of these statistics, Better Family Life, Inc. implemented the Teen Pregnancy Prevention Program. Click Below To Sign Up For Our Monthly Newsletter!